Gustavo 'Turnpike' Sanchez is a man with a mission: he is planning to replace every last one of his unsightly teeth. Written in collaboration with the workers at a Jumex juice factory, Teeth is a romp through the industrial suburbs of Mexico City and Luiselli's own literary influences. Valeria Luiselli is as much a cartographer as a writer, interested in finding areas still unmapped ... [S]he combines fictional narrative with historical and intellectual points of reference, and the result is writing without preconceptions, as airy and open as a soccer field. At every turn, the book has this careful architecture, even if it feels like a strange, blind alley. Luiselli writes with a confidence that demonstrates she's going somewhere. Filtered through Luiselli's brilliant, polymath imagination, there's nothing icky about all those 'ics' — various modes of storytelling, each showcased in its own chapter. 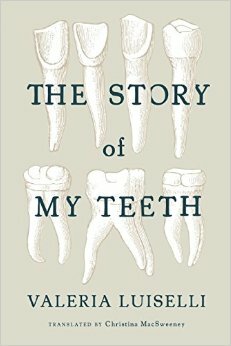 What did you think of The Story of My Teeth?